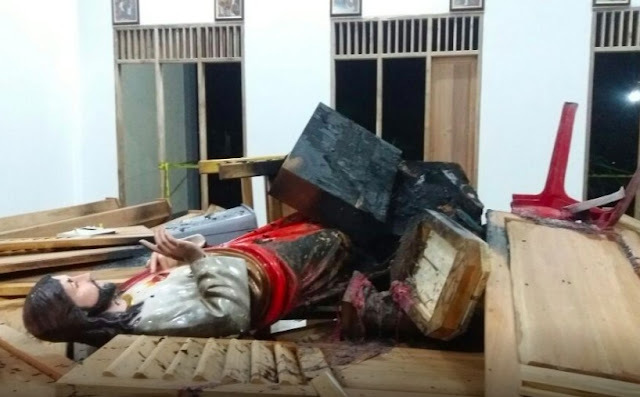 Palembang (Agenzia Fides) - The chapel dedicated to St. Zaccaria, recently inaugurated in the diocese of Palembang, in the South of the Indonesian island of Sumatra, was attacked on the night between 7 and 8 March by some vandals who destroyed a stained glass window and devastated the interior of the church and liturgical furnishings. This is confirmed to Agenzia Fides by Archbishop Aloysius Sudarso, of the Priests of the Sacred Heart (Dehonians), at the head of the Archdiocese of Palembang. "Last March 4 – he says to Fides - I had blessed the new chapel situated in a village in an isolated area, a three-hour journey from the parish. It was a celebration in an atmosphere of supreme cordiality, with the heartfelt participation of village leaders, civil authorities, Muslim religious leaders. The church was built following all the regulations and the necessary legal process. This act of gratuitous violence surprises us, but we believe it is the work of few radical members who want to fuel, here and throughout Indonesia, religious hatred, intolerance and violence". The Archbishop informs that now there is the parish priest, police officers, civil authorities and many ordinary Muslim people on the spot, who have come to express sympathy and also to help clean up the church. "The police are investigating. Acts of desecration like this are perceived as a shame for the whole society", he declares. Mgr. Sudarso, on expressing condemnation and bitterness, reports that the response of the local Church is "the search for justice, according to the rule of law, without falling into the trap of emotional reaction: we are saddened by this act but the solidarity received by many Muslims consoles us", he observes.